Likewise, Methodist churches across Florida are finding that performing arts ministries provide an effective way to reach out to the community, attract new members and promote inclusion and diversity. Elizabeth Bearss, a member of the award-winning Royal Blush singing quartet, leads a section rehearsal at a youth harmony workshop hosted in the fall by Van Dyke UMC, Lutz. Photo by Susan Green. Van Dyke UMC in Lutz, for example, has opened its doors for several years to middle and high school students interested in barbershop harmonies. The outreach this year attracted 400 young people, making it the largest student music festival of its kind in the state and the second largest in the nation. “Our one-day vocal music workshops give the youth in our area a chance to see what our campus is like,” said Denise Helbig, the church choir director who helps coordinate the festival. Sometimes the youth return to Van Dyke to join the music worship and eventually bring their parents. Cocoa UMC similarly attracts youth through the Cocoa Performing Arts Initiative, a scholarship program for young people up to age 21 who otherwise couldn’t afford the training. Rev. Eugene Yotka, Cocoa's pastor, said the church set out to develop a vital youth and young adult ministry and discovered through research that the community had a strong interest in performing arts. Church leaders formed a partnership with a local Christian-based academy that offers dance, acting and singing lessons for the target age group. The resulting scholarship program pays for lessons and equipment. Selected students agree to pursue their studies with vigor and commitment, do four hours of community service each month and attend a weekly one-hour mentoring meeting with church discipleship leaders. “Thus far, this has resulted in 12 scholarships, which in turn has resulted in a mentoring group of 22 children, youth and young adults,” Yotka said, noting that scholarship recipients often bring friends to mentoring sessions. 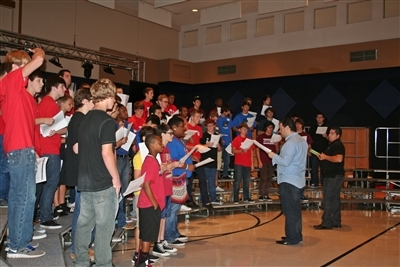 Boys rehearse their musical parts in the gym at Van Dyke UMC, which hosted a countywide barbershop harmonies workshop for middle and high school students. Photo by Susan Green. The expressive nature of performing arts can also enhance character development among young people who may be so mired in youthful angst and challenges that little else can move them. Take the Ministry of Liturgical Dances at Nueva Vida UMC, Pembroke Pines, for example. “This ministry serves to form youth character in terms of Christian service because it aims to involve young people in the life of the church by providing them an opportunity to recognize and enrich their God-given gifts and talents,” said Rev. David Fernandez, pastor. He said the dances convey uplifting messages and the inclusive, team-building aspects help young people feel important to the church and learn to get along. “Two young men had had small discrepancies between them and the relationship between them was not very good,” Fernandez recalled. 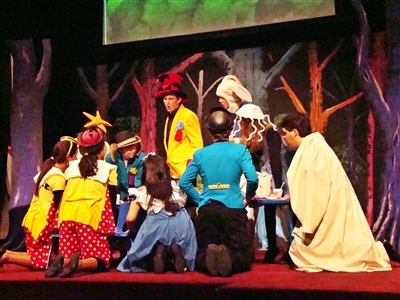 Hayden Rice, center, a recent graduate of South Shore UMC's youth ministry, leads summer theater camp members in a scene from the Walt Disney musical "Alice in Wonderland," junior version. Photo by Susan Green. Similarly, South Shore UMC, Riverview, strives to help youth develop their talents and spiritual gifts through a two-week summer theater camp that culminates with the performance of a musical play. As young people hone their theatrical and musical skills, they also learn about working together in service and striving for excellence. “We tell them from the beginning, ‘We are going to act and treat you like this is a professional production. But this is also a learning experience, so it’s OK to ask questions,’ ” said Chris Haden, former youth pastor and now worship director. Coaching teenagers into staging a worthy production in a short time has its challenges, but Haden sees value in it. That kind of transformational experience – for youth and adults alike – was a major goal of St. Luke’s UMC, Orlando, when it staged the musical “Hairspray” in August, said Dawn Fleming, marketing and communications director at the church. 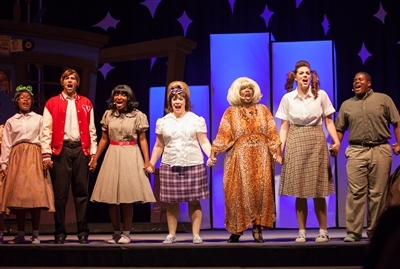 St. Luke UMC's performance of "Hairspray" provoked thought about hospitality and prejudice. Photo by John Logan. “A few years ago, during a visioning process about where we wanted to go and what we wanted to accomplish in the next five years, we determined that we wanted to speak to and reach people who felt disengaged,” she said. Church leaders purposely selected the secular, award-winning Broadway musical about a 1960s-era, plus-sized teenager in Baltimore that offers a humorous look at the serious subject of prejudice. "'Hairspray’ was the perfect vehicle for our church to start the conversation about acceptance and what it means to be hospitable,” Fleming said, adding that the four sold-out performances drew a lot of first-time visitors to the church. * Colleen Hart is a freelance writer based in Cocoa, Fla.